The national governments of the world’s leading industrialized nations are failing to fulfill their pledges to end fossil fuel subsidies, according to a new study produced by the Overseas Development Institute, Oil Change International, Natural Resources Defense Council and Global Subsidies Initiative. Seven years remain until an agreed to 2025 deadline to end fossil fuel subsidies is reached. That said, G7 countries continue to provide substantial support for the production and use of oil, gas, and coal,” the group of organizations states. 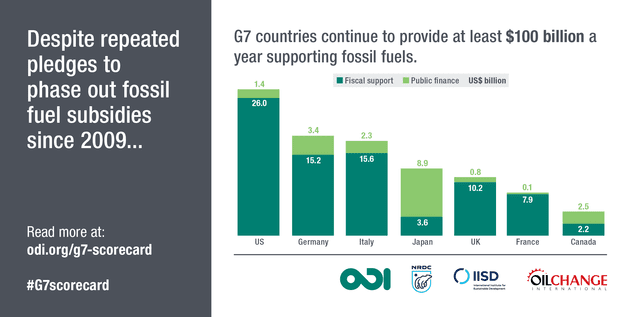 G7 governments supported production and use of fossil fuels to the tune of at least USD81 billion in fiscal support and USD20 billion in public finance on average in 2015 and 2016, according to the report. Their failure increases the likelihood that global greenhouse gas emissions will continue to rise, and that the global community of nations will fail to limit the rise in global mean temperature to the 2°C (1.6°F) limit posited as a tipping point by the UN Framework Convention on Climate Change and agreed to in the 2015 Paris climate agreement. Pledges, what good are pledges? The G7 countries in May 2016 pledged to phase out and end all “inefficient fossil fuel subsidies” by 2025, the G7 fossil fuel subsidy tracking group points out. They have been tracking the G7’s progress since. “Despite their numerous commitments, not only have G7 governments taken limited action to address fossil fuel subsidies but they have also failed to put in place any mechanisms to define and document the full extent of their support to oil, gas and coal, or to hold themselves accountable for achieving these pledges. 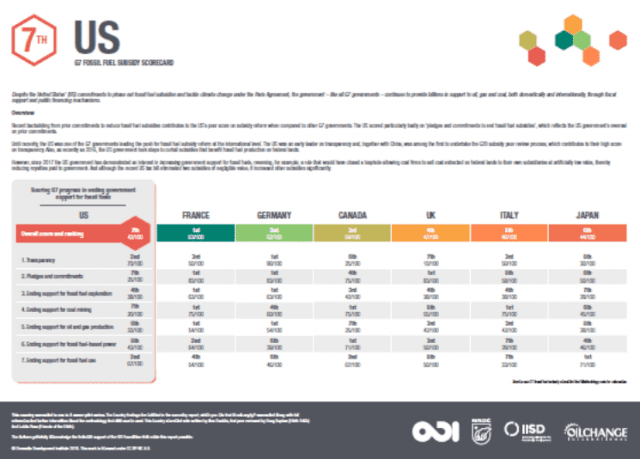 The G7 fossil fuel subsidy scorecard aims to address this accountability gap and track, for the first time, each G7 country’s progress in phasing out fossil fuel subsidies across seven indicators,” the report authors state. The US ranks at the bottom of G7 countries when it comes to fulfilling its pledge to phase out fossil fuel subsidies by 2025. According to the report, the US government has provided $28.0 billion in fiscal support and another $1.4 billion in public finance to support fossil fuel production and use since 2009. As anticipated, US progress to reduce fossil fuel subsidies has suffered from the change in administration – the election of Donald J. Trump as president, the report highlights. That resulted in a poor score overall relative to other G7 governments. More particularly, the US scored poorly when it comes to “pledges and commitments to end fossil fuel subsidies.” That’s reflective of the Trump administration and supporting Congressional members’ efforts to rescind pledges and commitments made during previous President Barack Obama’s two terms in office. Such efforts include rescinding the Clean Power Plan, and withdrawing the US from the UN Paris climate change agreement. Overall, the US received an overall fossil fuel subsidy phase-out grade of 42 out of a possible 100. France scored best with a 63. Germany (62), Canada (54), the UK (47), Italy (46) and Japan (44) followed.